Every now and then I will stalk visit the social media profiles of the tweens and teens in my life. They try to hide a lot of dirt through acronyms and slang, but I’m not that old. I get it. One day I came across one popular acronym that really made me cringe. TBH. To Be Honest. 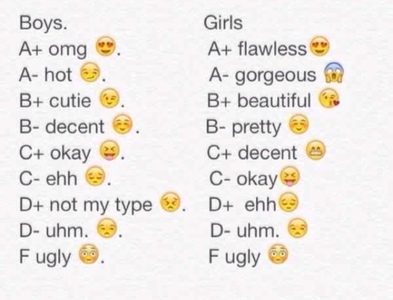 The idea is that someone writes a post asking you to like their status for a TBH rating. 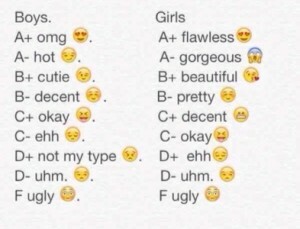 If you ‘like’ the person’s status, then they will give you a rating of what they think about you. What could go wrong with this? Most of the posts I read consisted of people rating each other on their physical appearance and their popularity at school. Some ratings were kind, but let’s be real, not all TBH ratings are positive. I read some pretty mean things that would crush the self-confidence of most adults. The problem with this is that many kids will internalize the negative comments and before you know it, it becomes their self-talk. They start to believe the negative comments said about them. This no doubt will negatively impact their mood and the experiences they have. So how do we go about protecting children from falling prey to stinking thinking? While there is no simple answer, I believe talking to children and helping them become secure in who they are is a place to start. I find that teaching children affirmations for self-esteem helps to boost their self-confidence. I’ve included a set of 30 different affirmations for self-esteem that I typically use when working with children. An affirmation is anything you say or think about yourself. All of our self-talk, both negative and positive, are affirmations. When kids are prone to constantly saying and thinking negative things about themselves, they will need to retrain their brains to think more positively. They can do this through practicing positive affirmations for self-esteem. 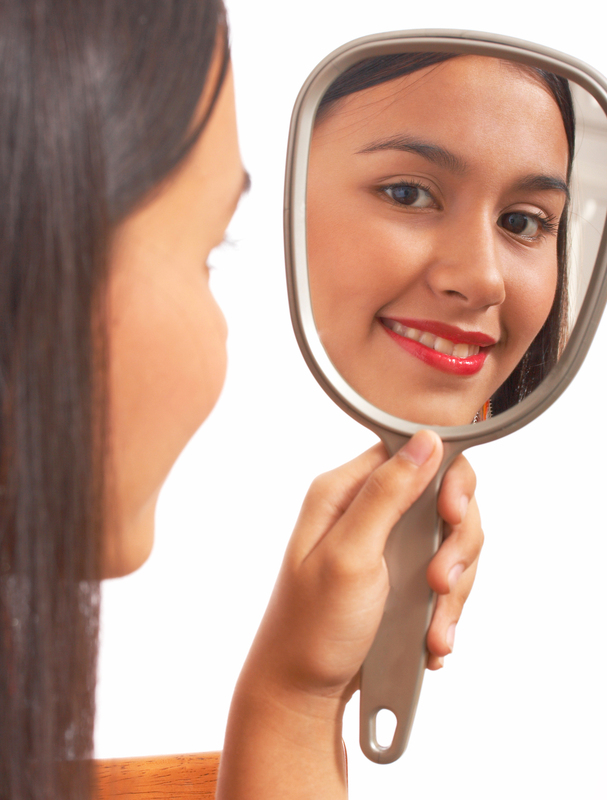 Positive affirmations are statements designed to build self-esteem through changing negative self-talk. These affirmations for self-esteem make children feel good about themselves and help them embrace their positive qualities. In order to understand how affirmations work, we need to know a little about the brain. The brain has centralized control over all the other organs in the body. It is constantly sending and receiving messages to help the body function properly. Since the brain processes all this information on the spot, it takes everything we say and think literally. The brain doesn’t distinguish between real and fantasy.This is why scary movies frighten some people even though they know what’s happening is not real. Therefore, when kids repeat positive affirmations for self-esteem, their brain receive it as truth. Even if they haven’t fully internalized and owned the positive statement. Why Should Kids Repeat Positive Affirmations Often? Regularly reciting positive affirmations for self-esteem can interrupt the incessant negative thoughts some kids have. This provides them with an opportunity to retrain and reprogram their brains to think more positive thoughts. The more we say or think something, the more likely it is to become a hardwired belief. If we can get children to focus on their positive traits, then they are less likely to define themselves based on their negative self-talk. Keep affirmations positive. Instead of saying “I am not a bad friend,” a better option would be to say “I am a good friend.” When you say I’m not a bad friend, your brain needs more information to make the leap that you’re trying to affirm that you’re a good friend. Remember, the brain is taking in a ton of information at lightening speed. Saying I’m not a bad friend doesn’t offer an alternative. Your brain doesn’t stop to interpret that the opposite (I’m a good friend) is what you mean. Also, stating affirmations in the negative serves as a constant reminder of the negative behavior or circumstance you are trying to change. This can bring down your mood and kill your motivation to make changes. Write affirmations in the present tense. Everything happens in the present moment for the brain. It doesn’t communicate in future or past tense. For example if you’re worried about failing a test you have a month from now, you experience anxiety in the moment. You’re brain can’t tell that your concerns are about something in the future. It responds to your fearful thoughts as if you’re taking the test right now. Have children state their affirmations as if they are happening now. “I am getting good grades” is more effective than saying “I will get good grades.” Additionally, stating their affirmations in the present tense gives them inspiration and motivation to work towards their goals. Keep affirmations short and to the point. This will make it easier for children to remember and practice their affirmations. When affirmations are too long, kids tend to spend too much time trying to memorize the affirmation instead of focusing on internalizing and truly believing the affirmation. Allow children to decide what affirmations they want to create. You can certainly guide them, but in the end you want them to take ownership of the process. This will make them more likely to commit to practicing their affirmations. 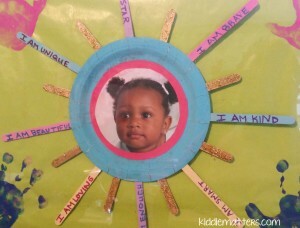 This affirmation sun is hanging on my daughter’s wall to remind her of all her positive qualities. I have provided some free affirmations for self-esteem designed for younger children. This set includes 30 different positive affirmations for children. 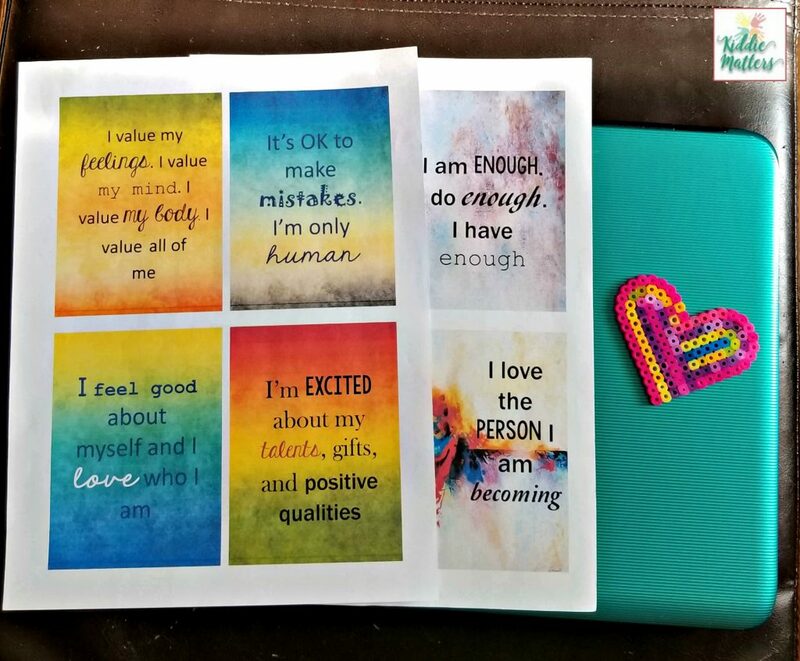 If you would like a copy of these affirmations for self-esteem, please sign up for our monthly newsletter, The Social Emotional Toolbox. 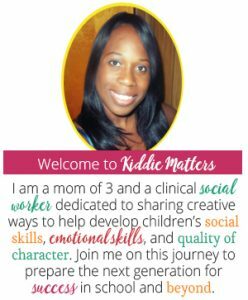 When you sign up for our newsletter you will receive monthly social and emotional activities, tips, and printables. In addition, you gain VIP access to our library of free social and emotional resources. You can subscribe to our newsletter here. If you are looking for affirmations for self-esteem that older children can use, these positive affirmation cards for tweens and teens are available for purchase here. Adolescence can be a rough time for kids. 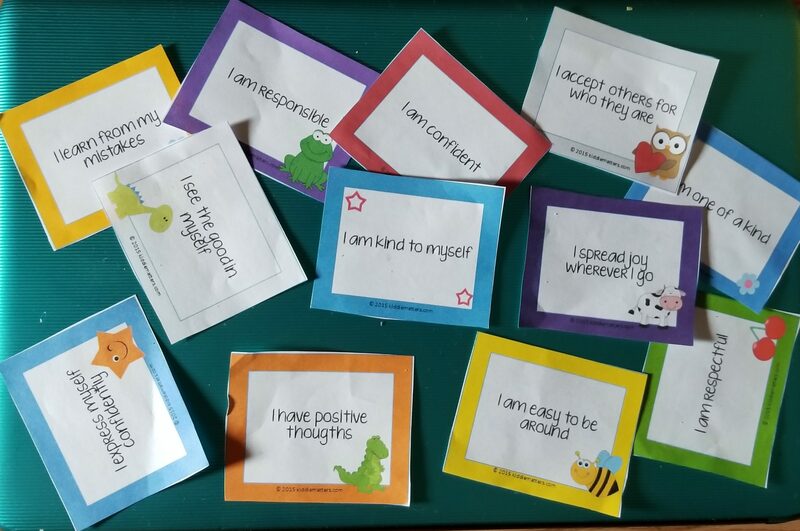 Teaching them about positive affirmations will help them develop and maintain their self-confidence as they navigate their way through this turbulent developmental stage. I agree that kids need positive affirmations in their life. Unfortunately, They also need to be taught how to handle criticisms so that it does not break their spirit, because there are some rather unkind people in the world. You are so right. Kids can be brutal these days and the kids who don’t know how to handle conflict are at a great disadvantage. Thanks for stopping by! Oh yes! How to handle criticism is a huge one, super important. Would love to get some tips on that. Cognitive flexibility is something else kids lack these days. I couldn’t agree with you more about the power of affirmations especially when you start at a young age with your children. I have had my now teenage girls develop affirmations and for the most part it has helped in these brutal teen years. There are days when all the affirmations in the world won’t help but they are incredibly rare! All good tips! And while I agree that self-encouragement is very important, we are social creatures, so wanting to seek out social endorsements is a natural instinct. Back in middle school, when someone was having a rough day, we would do Lemon Squeezes (fan-fold a piece of notebook paper and then pass it around the class; everyone then writes something positive about the recipient on a fold, keeping the others private). It was a great exercise is giving compliments, recognizing others good qualities, and a nice thing to look back at when the going got tough again. I love these tips and I have definitely been guilty of not keeping the affirmations positive. I will change my verbiage to correct this! Thank you for the tips! What a great idea! Positive affirmations are wonderful for building a strong foundation in a child’s mindset and outlook on life. I love this post! These tips are great! While I love my mother dearly, she had a hard time helping me with positive affirmations for myself and as a result I spent most of middle and high school way too preoccupied with the opinions others had of me. I sort of had to go through it and teach myself, and it’s been difficult but I believe I’ve done alright so far with overcoming critisisms and remaining positive. Now I have to learn on working with my son to teach him the same so I can break the cycle, so to speak, and maybe help him experience better tween and teen years than I did. This is a really sweet idea. Definitely something to think about for my daughter… words to say to build yourself up. I absolutely love this post! What a wonderful and important thing to teach our children! I love this positive reinforcement rather than negativity. These cards are a great way to remind our kids to focus on their good qualities. It is unfortunate that we live in a culture that continues to pressurize children into accepting validation from their peers and we as adults must take steps to ensure that their self-confidence is not damaged in the process. I’ve taught in the classroom for seven years and it’s always amazed me how mean kids can be to each other. I try to have as many positive interactions and team building things in the classroom as possible to encourage them to treat each other nicely. These are some really good tips to help build a child’s self-esteem and confidence . Every parent should try this! Such a positive message. It’s so important that we give kids the right inner monologue and teach them how to speak kindly to themselves through how we speak to them. Great post. This is a wonderful message and such great ideas! Its so important to teach kids love themselves! This is so important. I love your post and the help it gives parents teaching their kids! Thanks so much! Keeping attitudes and thoughts positive is a huge benefit. Helping teach kids how to take a positive approach to pretty much everything is a valuable life skill. Thanks for the printables! I really love your blog. Its so informative and creative. I’ve seen the tbh before and I don’t get it. It’s like a false way to try to gain compliments but it can go very wrong and cause self hatred. But these affirmations are a great way to battle things like that!! This is such a great idea to help kids build self esteem! I know I am guilty of NOT doing these for myself, so it would be a good idea for me as the parent to practice these in front of my kids as well to lead by example! Great, timeless blog post. I love affirmations and look forward to incorporating them into my kids’ lives. Thank you for sharing these tips.